The Scottish Terrier is one of the descendants of the old Scotch Terrier, along with the Dandie Dinmont, the Cairn, and the West Highland White Terrier. The exact origin of the breed is obscure, but a dog of its general description dates back to some of the earliest records. The low stature and wiry coat have always been important characteristics relating to the original purpose of the breed, which was to hunt and kill the various species of wildlife such as the fox, badger, weasel, and rat that made life hard for the early Scottish farmers and crofters. The loss of livestock could well have made a huge difference to these folk, whose livelihood depended on the produce from their land, so a dog was developed which had exceptional strength and courage in a compact, tough package. These traits are still the hallmark of the breed today. 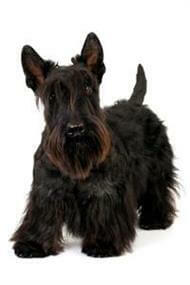 Scottish Terriers live up to 12 years of age. The Scottish Terrier is an adaptable little dog, which will fit in with most households. It is not always demonstrative with its emotions, however, its devotion and loyalty to its family are boundless. Although affectionate towards members of its own family, it is every bit the game terrier when strangers or other dogs are involved. If allowed, it will take on any dog, regardless of breed or size that invades its territory. While they can be extremely tolerant and good-natured regarding the antics of children, it can be cold, and even belligerent with strangers. It really prefers to be a one-man dog and these qualities make the Scottie an excellent watchdog. The Scottish Terrier can live harmoniously with other pets providing care has been taken in introducing the pets to each other. It is not uncommon to find households where Scotties share living quarters with cats, guinea pigs and other small pets. The Scottish Terrier is an active breed and requires regular exercise, but its short legs mean less walking for its owner in order to provide the dog's daily requirements. The Scottie is not a good jogging companion, but makes an ideal walking companion. It is important that it is walked on a leash, as the dog's hunting instinct can entice it to run after a rabbit or a cat, into the path of an oncoming car. The grooming needs of a Scottish Terrier will vary according to the lifestyle you choose for it. For a pet, all that is required is a thorough grooming with a good pin brush, followed by combing twice a week. Although the Scottish Terrier does not need the high fences required by some other breeds, it does, for its own safety, require secure fencing - particularly around swimming pools. This breed can become destructive if not given enough mental and physical stimulation. Make sure the dog's environment is hazard-free.